I can still vividly remember it. Talking to a friend from high school on AIM, him sending me the link to some obscure site that he had mentioned to me called thefacebook. “BG has it now,” he said, telling me to register. I was skeptical. thefacebook? What does that even mean, but I followed his prodding and created an account. 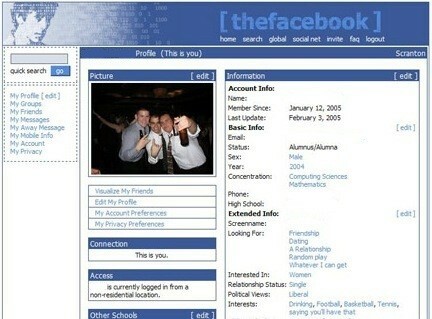 That was November 16, 2004, and it was the first day that thefacebook.com was available at Bowling Green. I fell in love with the site instantly. I thought that it was fantastic and amazing. Seven years later, I still have that since of wonder with the site and with the ways in which it has changed our world. When I first joined, there were only a couple hundred people on the Bowling Green State University network, and you could literally look through thumbnails of all of the profiles in the entire network (now there are over 40,000 people on the BGSU Facebook network). At the time, I was writing a column for the BG News, and though I wasn’t scheduled to have a column for several more days, I knew that I had to write about the site and successfully got my column moved up. It was a very different world. Slowly but surely, all of my friends started to get Facebook pages. Some of them actually said that they would never join Facebook. But they all came around. BG was the 38th school to get Facebook. When the site was new, schools were added individually. Ohio State, Ohio University, and Miami University all had Facebook by that time, but the other large schools in this state wouldn’t get it until later. But originally, this wasn’t how people utilized the site. Posting on your own wall was a Cardinal Sin of Facebook. It would be like laughing at your own joke. Facebook did have a space under your profile picture where you could post an away message (basically a 2004 version of a status update), but many didn’t do this. “Why on earth would I post a status on Facebook when I can just update my away message on AOL Aim?” You couldn’t chat on Facebook then. And it was probably for the best. It would have blown all of our minds. The lack of an instant messaging feature was just one of the many aspects of Facebook that were nonexistent when I joined. There were no photo albums. We each got one photo, and it was our profile picture, and we were thankful to have it. There were no “likes.” If you liked something in 2004, no one knew. We did have groups. You could create a Facebook Group which people could join. For some reason an inordinate number of groups were dedicated to the movie “Napoleon Dynamite.” No idea why because in 2011 – as was the case in 2004 – that movie stinks. No games. If you wanted to create a farm, you had to actually go outside and plant things. In the ground. No parents.. People who are new to Facebook over the past few years might not know this, but when non college students were allowed to join, we hated it. And hated them for joining. We didn’t checkin based on our locations. The idea would have been horrifying. I mean, we all flipped out when Facebook started posting information that your friends had ALREADY POSTED on our Newsfeed. We certainly didn’t have Facebook on phones. A lot of people weren’t even texting yet. Now. I primarily check Facebook from my phone. Most days – ok, every day – I have checked Facebook before I’ve even gotten out of bed in the morning. Comments were different too. If you post a status now, people can comment on it. It wasn’t like that originally. People could write a separate post in relation to what your post was, but it would not have been a continuous thread. When the movie “The Social Network” came out, I felt like it did a great job of capturing the buzz that Facebook originally created when it was new on college campuses. Today, even crazy and incoherent old people who don’t know how to work computers have heard of Facebook. It’s ubiquitous in our society. While these features and new innovartions continue to keep Facebook on the cutting edge, it can’t be underestimated how important it was that the site was simple in the beginning. If Facebook had just dropped out of the sky in 2004 with all of the features that it has today, and we had had no context for how to utilize the site, I truly believe that it would been more complicated than what the average person would have been willing to attempt to learn. There were already sties that were more sophisticated at the time. I think that for some of these sites, part of their downfall was because of their sophistication and complexity. So in the absence of all of these innovations over the past seven years, what did we do on Facebook in 2004? We…um…we basically just read our friend’s profiles. It’s ironic, but there really wasn’t anything to the site.